The 24 metre catamaran motor yacht Samara has been jointly listed for sale by Mark Elliott at IYC and Ben Doggett at Aquasitions. Built by New Zealand yard Pachoud to a design by Scott Jutson, Samara was delivered in 2016 to owners who wished to cruise with or without crew, and is therefore almost entirely self-sufficient. An interior in light surfaces and pastel shades by Sylvia Bolton accommodates eight guests in four cabins comprising a full-beam master suite on the main deck, two doubles and a twin, all with entertainment centres, television screens and en-suite bathroom facilities. 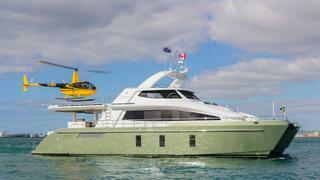 Two further cabins can sleep up to four crewmembers aboard this yacht for sale. The large open-plan main saloon serves as the heart of the yacht and cleverly blends a design suited for entertaining, including a 55-inch television screen, with the required practicalities of living on board long term. The ability to carry a helicopter is a major asset for a yacht of this size, allowing easy access to the yacht night and day, and Samara’s asking price includes a Robinson R44 helicopter. For ease of landing, the radar arch slides forward, the landing pad slides out and the guard rails fold down, creating an easily accessible helicopter deck that can also serve as a sunbathing area when required. Power comes from a pair of 800hp MAN R6 engines, which can deliver a maximum cruising range in excess of 2,500 nautical miles from the 14,000 litre fuel tank. Samara is asking $7,000,000, including her helicopter.